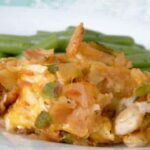 An easy casserole that the whole family will love - chicken, corn chips, and cheese - what's not to like? So simple that the kids can get dinner started before you even get home. Add broth and tomato juice to a pan. Add the onion and oregano. Simmer for 10 minutes, or until the mixture reduces a little bit. Add a layer of Fritos to the casserole pan. Sprinkle part of the chicken over the top. Repeat layers until all the ingredients are used. Pour the tomato sauce mixture over all, sprinkle with reserved cheese, and bake for 40 minutes.